When we were packing to leave DC, we got rid of (we thought) 75% of our belongings. A couple who had seen our house listed for sale online thought that it was empty and staged, so few were the furnishings in the photos. We patted ourselves on our backs for our heroic and successful effort to downsize. Well. We’ve been in Arizona for a month now and the new house is still full — stuffed, really — of unpacked boxes. Conversations, between Mr. History Tourist and me, consist mostly of: “Where do you want this stored?” and “Do you really need this?” It was time for a break. It was time to get back to the business of being a History Tourist. And Helldorado seemed a good place to start our Arizona tenure. When the mines died in the late 1880s, so did the town. Until, that is, the 20th century, when Hollywood discovered Wyatt Earp and the gunfight at the OK Corral and Tombstone’s tourist industry was born. 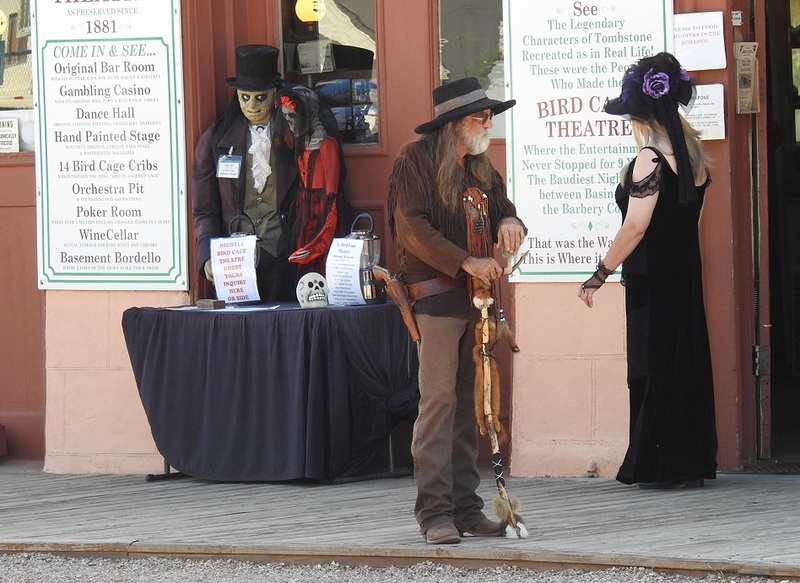 Tombstone advertises Helldorado as “a true to life reproduction of Tombstone’s rip roaring days” — which would be the 1880s — and I do remember that, during my childhood at Fort Huachuca mumble mumble years ago, stories of some major hell-raising would come out of this annual event. 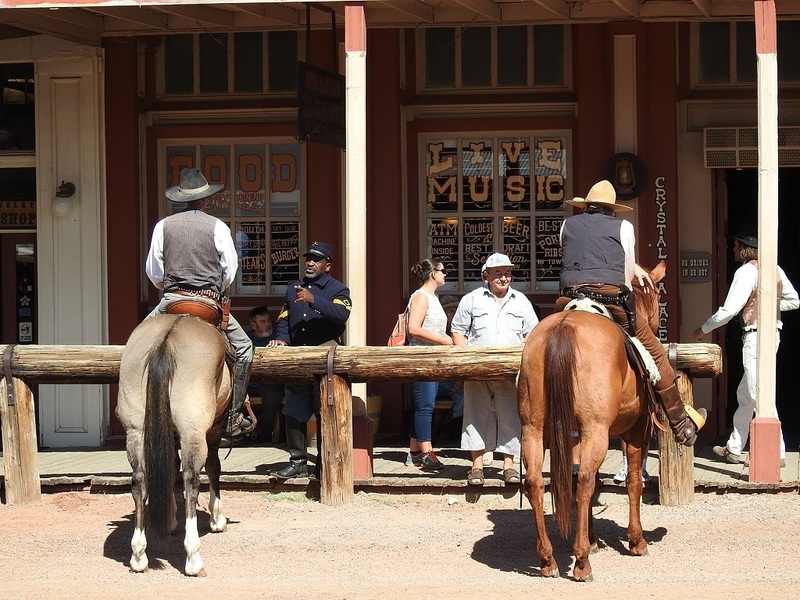 Arizona allows the carrying of guns, open or concealed, with no permit necessary. Last year, during a staged reenactment, one of the actors shot five live rounds and hit a fellow actor (who, lucky for both, survived). He also grazed a bystander, and hit a couple of commercial buildings. The reenactment group was responsible for inspecting all the guns in the show, to ensure that they were using blanks. Guess that didn’t happen. For the guys, that didn’t differ much from the other days. For the women, it meant there were lots of large bosoms falling out of tight corsets, and lots of questionable lower body coverings (or uncoverings) in styles that I’m sure neither Wyatt Earp nor Big Nosed Kate would recognize. It all reminded me of a western-themed Renaissance fair: an excuse for people to dress up in fantasy costumes that had nothing to do with historical accuracy. Coming from the Land of Obsessively Accurate Historical Costuming (aka Civil War reenactments and Colonial Williamsburg), it was not (she says, fanning herself and looking for a swooning couch) what one expected at all. We took no photos of the scantily dressed women of Tombstone, so you’ll have to look at Sheriff Misty instead. 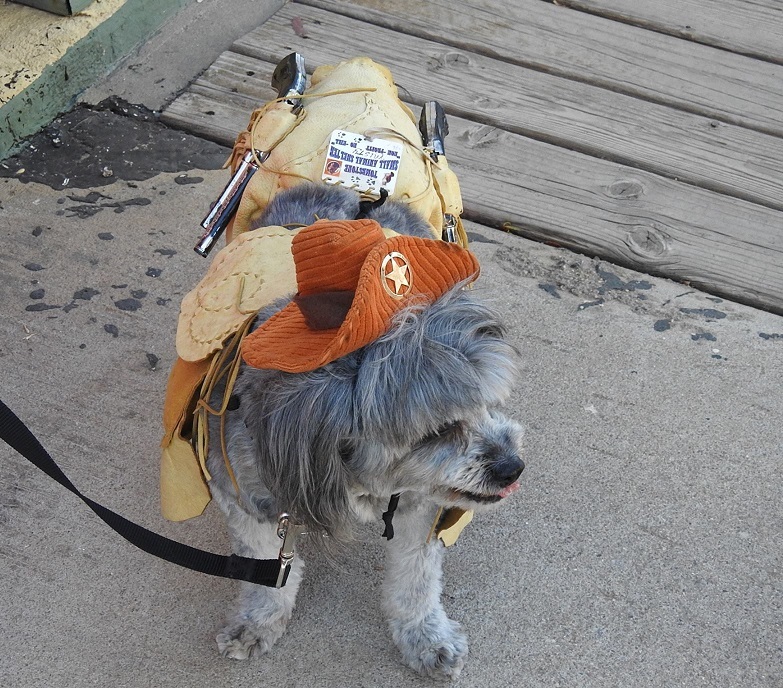 She was collecting donations for the Tombstone animal shelter. And she was the best dressed reenactor at Helldorado. After a couple of hours that included lunch (at the Longhorn Restaurant, which was very good) and a couple of turns up and down Allen Street (the main tourist and business drag) we decided that we’d been bosommed-out for one day. We moved on to Bisbee. 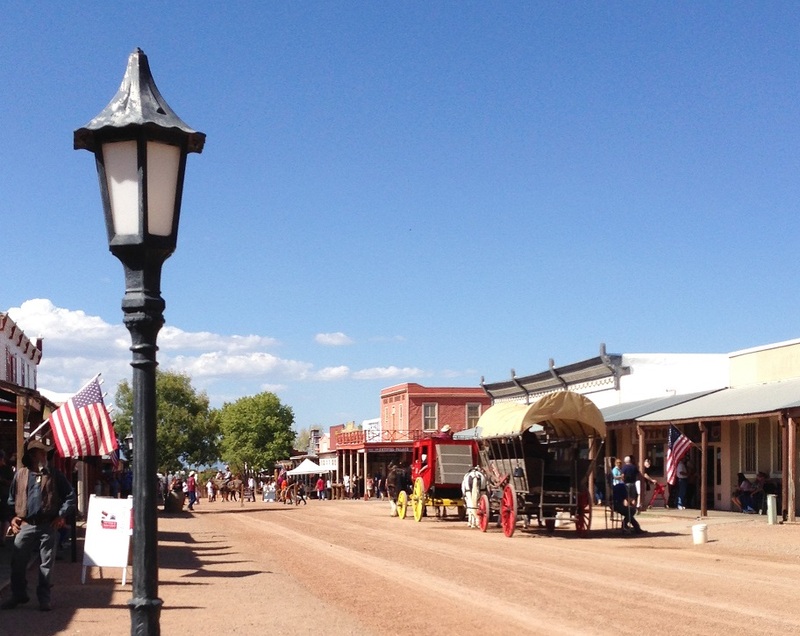 I really love Tombstone, but recommend avoiding the extra traffic and crowds by not going during Helldorado, which I found a little sad and shabby. Maybe we hit it at the wrong time. Maybe it gets livelier in the evenings. Maybe Sunday, with its parade, would have been a better bet. Maybe, maybe. Maybe I was 30 years too late. 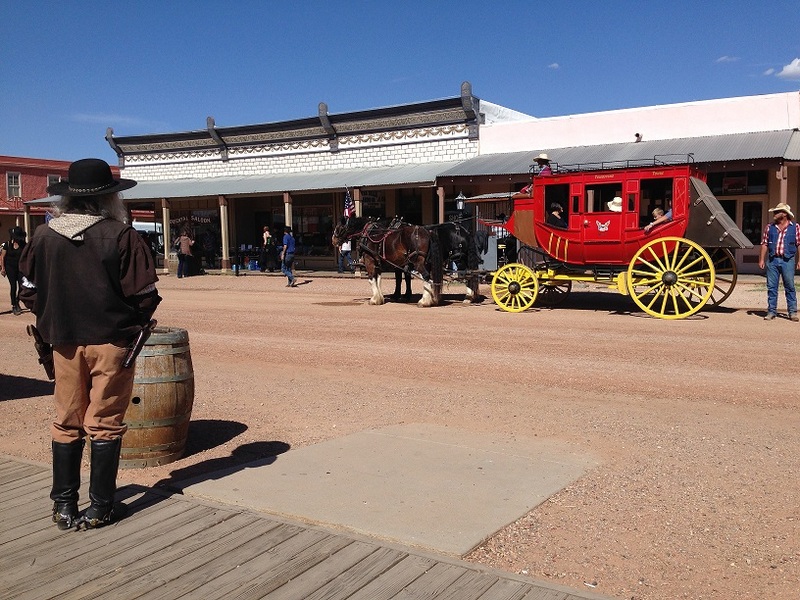 Gallery | This entry was posted in Arizona and tagged OK Corral, Tombstone, Wyatt Earp. Bookmark the permalink. By coincidence I watched the film ‘Tombstone’ only last night. Much better than the Kevin Costner ‘Wyatt Earp’ – in my opinion! I haven’t seen either of them. But since you’re recommending Tombstone over Wyatt Earp, I think I’ll start with Tombstone. Little Misty is adorable!! When we used to go to Tombstone, in the dark ages, there was a shop on the main drag selling stones and minerals. That was my favorite. The gentleman who ran it encouraged my interest and shared info on his stock. I don’t remember if there’s still a stone and mineral shop. Tombstone has upscaled somewhat. I think they’re trying to compete with trendy Bisbee, just down the road. More latte-serving coffee shops. Thanks. Yes, its very different. My 90-year-old father needs some oversight, so we’ve moved closer. I was raised here and swore, when I left, I’d never come back. Yet here I am. And actually enjoying it. Read an interesting toshy romance book that had some great history about Tucson, Tombstone and others. Think I mentioned it somewhere on my blog. The history part made it a decent read. Hope your dad enjoys your proximity.